Hurriyat (M) chairman Mirwaiz Umar Farooq was detained on Tuesday after he tried to defy his house arrest to march towards Lalchowk. The spokesman said that Mirwaiz came out of his Nigeen residence around 11:30 am where he has been placed under house arrest. “He tried to march towards Lalchowk, but a large posse of policemen deployed there foiled his march by detaining him,” he said. Mirwaiz, according to a spokesman, was lodged at Nigeen police station. Joint Resistance Leadership (JRL) comprising Syed Ali Geelani, Mirwaiz Umar Farooq, and Yasin Malik had called for ‘Lalchowk Chalo’ today against the Kulgam killings. Hurriyat (M) chairman Mirwaiz Umar Farooq on Tuesday said that while the unflinching belief of people in their struggle is the greatest source of strength for us all, one other thing that can unnerve even a great adversity is the strength in unity. So all of us have to unite from one end of the spectrum to the other, like we did on the 35A assault and launch a joint agitation against the continuous killings under the garb of CASO. 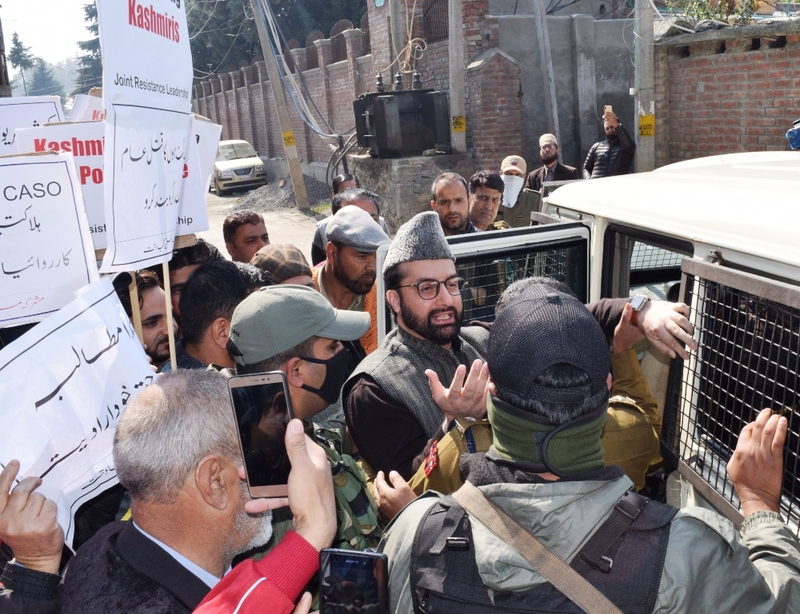 The spokesman said that Mirwaiz was arrested by the police when he broke the cordon around his house to lead the march towards Lal Chowk as per JRL program to protest the Kulgam killings by the government forces. A large contingent of police posted outside his house and in the lanes leading to it were barricaded preventing Hurriyat activists and media persons from reaching his house to join in the march. Before his arrest Mirwaiz said that Kashmir has been turned into a “slaughter house” where Kashmiri’s are killed with impunity, as part of a state policy of crushing us to contain our struggle for self determination and continue our subjugation. He said a nation which kills small children and pregnant women has lost all sense of humanity and morality and to ask them for probes or action against perpetrators of killings is travesty of justice and humiliating the victims. Mirwaiz said going by the totalitarian outlook of New Delhi and its contempt for human rights of Kashmiri’s exhibited in the methods being employed to “kill civilians and destroy homes” and properties including missiles and heavy machine guns, that day may not be far when we may be bombed out.